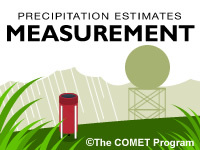 This is part one of a two-module series on estimation of observed precipitation. Through use of rich illustrations, animations, and interactions, this module provides an overview of the science of precipitation estimation using various measuring platforms. First, we define quantitative precipitation estimation (QPE) and examine technologies for remote sensing of QPE, including radar and satellite and the strengths and limitations of each. That is followed by an examination of the use of rain gauges for precipitation estimation and important issues to consider with rain gauge measurement. Finally we provide an introduction to the strengths and limitations of using precipitation climatology for QPE including PRISM. Very helpful. My professor recommended taking this lesson and it didn't disappoint! It might be useful to update this course and consider newer technologies that have been adapted in the last decade. The final quiz had too many variables. Use questions with only one right answer. Reading the sections rather than watching the videos were much more effective for me. Found the lesson useful as a supplement to class work about precipitation in hydrology. Wow, this topic is very creative and easily to understand. This module is so helpful in my studies. Very interesting topic about understanding rainfall and the tools used. As a CoCoRaHs observer (www.cocorahs.org) I feel this module contains valuable information for all who are interested in precipitation estimates. Great lesson and well thought out. The under catch animation was especially helpful. The module is very helpful and informative. This module tells you all about how they estimate precipitation. It was informative, but not quite what I am interested in. I had to take it as it is a part of the Understanding the Hydrologic Environment. Define quantitative precipitation estimation (QPE). List the tools used to measure precipitation. Explain a drop size distribution (DSD). Explain a Z-R relationship and its limitations in radar-derived QPE. Explain how the radar's ability to estimate snow QPE may differ from rain QPE. Understand the basics of radar-derived precipitation from dual-polarized radar. Illustrate what is meant by inconsistency in radar sampling and coverage. Be able to use radar climatology guidance. Describe the uses and limitations of satellite QPE. List some of the limitations of rain gauge measurements. Explain how wind, exposure, and turbulence can influence gauge catch for rain. Explain how the gauge performance for snow may differ from rain. Describe other ways to obtain snow water equivalent. Describe the general strengths and limitations of measurement from automated gauges. Explain how the strengths and limitations of manual gauge reports may differ from those of automated gauges. Describe how precipitation climatology may enhance QPE. Explain some key limitations of precipitation climatology. Describe weather situations that would likely result in useful estimates from each of the three measurement tools: radar, satellite, and rain gauges. August 2016 and August 2015: HTML and media assets in this lesson have been updated for current browsers and mobile devices. July 2014: Since the publication of this lesson there has been a significant amount of experience gained with operational precipitation estimation using dual-polarization weather radar. This experience is not reflected in the material originally published in 2009.